Walkway along the Verde River in Arizona. Low Impact Development (LID) is a stormwater management and development strategy that aims to design the built environment to remain a functioning part of an ecosystem. It uses specific techniques to plan and build sites to maintain or restore hydrologic function and can be used in conjunction with smart growth strategies that focus on preserving open space and redevelopment. LID emphasizes stormwater management at its source, using small, cost-effective landscape features. Incorporating LID design begins with site planning, with the ideal goal of designing the development to function with the smallest footprint necessary. It requires consideration of the site’s natural hydrology such as existing flow paths, areas with higher permeability soils, and riparian areas. Instead of large investments in complex and costly centralized conveyance and treatment infrastructure, LID integrates treatment and management measures into site features. This involves strategic placement of distributed stormwater controls to mimic a watershed’s hydrology and water quality regime to minimize surface runoff, pollution, erosion, and overall damage to waterways. A term that is often used interchangeably with LID is “green infrastructure,” and there is some disagreement about what each term means. In general, LID refers to site-level designs and practices to replicate pre-development hydrology. Green infrastructure generally refers to watershed or community scale approaches to stormwater management and focuses on practices that can be used instead of “gray infrastructure” e.g. pipes. In terms of practices, however, there is considerable overlap between the two terms. Communities incorporate LID requirements through ordinances and accompanying design manuals. 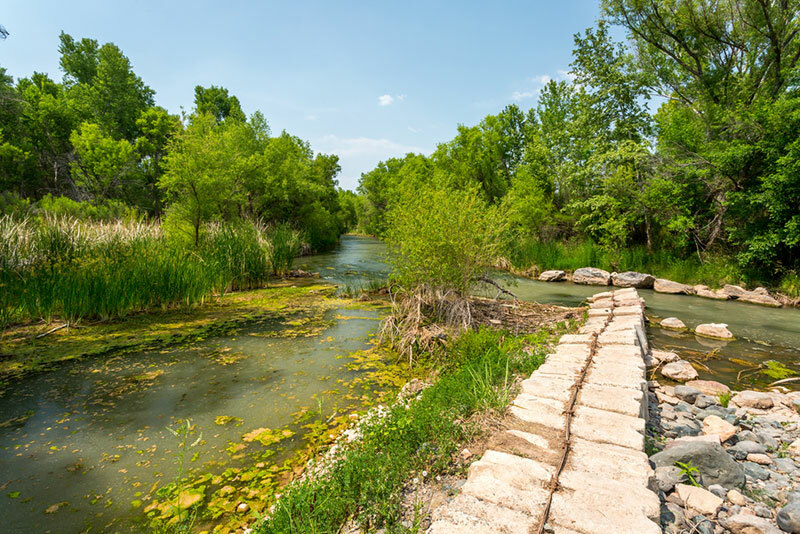 The Water Infrastructure Finance Authority of Arizona (WIFA) provides grants and loans for “Green Stormwater Infrastructure” projects, including stormwater management systems for streets and parking areas, stormwater harvesting and reuse projects, and establishment or restoration of wetlands. Because LID is a relatively new approach to stormwater management, design and implementation method guides can be particularly helpful to communities looking to adopt these practices. The communities of Mesa and Chandler, Arizona partnered to prepare a LID toolkit with funding from the Water Infrastructure Finance Authority of Arizona (WIFA). The toolkit includes a catalogue of LID tools including a description of maintenance needs, examples of current practices with recommended alternative LID options for new and existing development, and case studies with examples from Arizona. The report notes the role that city policies can play in encouraging use of LID tools, including through incentives that can include expedited reviews, tiered fees, and exceptions to certain density, setback, parking, and landscaping requirements for developers and builders. It also observes the role that cities can play in promoting LID practices through leading by example. This can include developing LID projects in highly visible areas to educate the public and integrating LID into municipal projects. The toolkit analyzes how LID practices can be introduced to better manage stormwater in the already developed Mesa urban core, an area with a large amount of impervious surface served by a traditional stormwater system. Commercial, government, residential, institutional, and street areas within the urban core were evaluated with regard to site conditions, potential LID strategies, and how much water could be harvested annually. Among a number of purposes, the toolkit was also intended to be used to review and assess current City policies, codes, and regulations in order to identify what would be needed to enable implementation of LID practices. In addition, it was intended to educate the public, developers, businesses, and City departments on the advantages and benefits of LID. The inventory of LID tools, LID options in place of current practices, and the case studies in the Mesa toolkit are transferable to communities throughout Arizona. WIFA funding can potentially provide much needed assistance for communities looking to undertake a similar analysis of possible LID sites and to development of LID projects. In addition to providing low-interest loans for stormwater projects, including LID, WIFA provides planning and design grants of up to $35,000. The Low Impact Development Toolkit prepared for the City of Mesa, Arizona can be found here. Low Impact Development Center Urban Design Tools can be found here. The Sustainable Cities Network offers a report on Green Infrastructure Case Studies, which can be found here.